//Sub/Corpus Blog: Shockwave Flash: Why won't you just die? Shockwave Flash: Why won't you just die? I used to be a true fan of Opera. However, I now use Google Chrome as my main browser. If Chrome gives me any problems, and only then, would I fire up Safari. I have come to like and depend on Chrome very much. Recently, Chrome has been giving me some troubles. It becomes unusably slow. I have to quit the application and start all over again. This used to happen when I've been using the browser for a few hours or more. Lately, the problem has been more frequent. 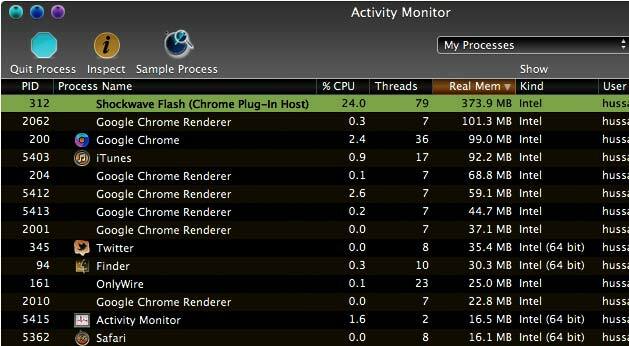 I did some Googling and found out that it what you call a memory leak and Shockwave Flash plug-in is to blame. Now that I've found the culprit, its time for me to again Google how to solve this problem. I can't just disable flash on my desktop. If I did I wouldn't be able to watch YouTube or any other flash videos on websites, right? Also, isn't flash going to die soon? Aren't we all switching to HTML5 or something? Well, at least thats what I keep hearing. So, how do you fix this in Chrome? Some help would be appreciated. u need to enable html5 from the above link (end of the page). then the videos will load in htm5 even in cosmic panda. Dear Google, I'm not in Australia !!! The Batmobile: Which one is your favorite ??? Addu Convention Center: Place looks good !! !